Even among the exalted Studio Ghibli back catalogue, Princess Mononoke occupies a special place: a huge success in Japan, it was Ghibli's breakout film on the international market and played a major role in establishing Japanese animation as an artistically respectable medium. While the film's impact might have obscured how little Ghibli has in common with the bulk of the anime industry, both before and since its release, its breadth and artistic power can't be denied. Princess Mononoke consolidates the themes of the conflict between humans and nature Hayao Miyazaki first explored in his manga series Nausicaä of the Valley of the Wind, later adapted for the screen; while wolf princess San shares a similarly heroic role as champion of the numinous forest spirits, her savage pragmatism and outcast status contrasts sharply with the messiah-like Nausicaä. 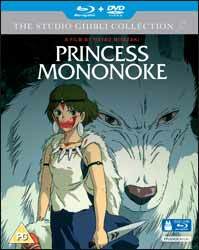 It's fitting that the iconic image of San with her face covered in blood from treating her wolf brethren's wounds is used for the Blu-ray cover illustration; even San's romantic relationship with Ashitaka can't wholly return her to the fold of civilization, as ultimately seen in the film's bittersweet finale. While earnest Ashitaka is the viewpoint character of the film, trying to keep the balance between the human and divine factions and avoid bloodshed, the most compelling relationship is the enmity between San and the splendid Lady Eboshi, leader of the iron-mining community that threatens the forest. A powerful martial figure in the tradition of Nausicaä's Lady Kushana, Eboshi embodies the tensions of the film: while ruthlessly pragmatic and utilitarian in her goal of cutting down the forest and killing its gods, she tirelessly works to create a matriarchal micro-society of ex-prostitutes and lepers, resisting the power of the distant Emperor and ambitious local lords with ease. Miyazaki's much-remarked feminism is at its strongest in these two characters. It's striking as always with Miyazaki that while greed and short-sightedness bedevil his human characters, true evil is nowhere to be found, save in the crawling corruption that overtakes the gods as they succumb to hatred and which threatens to pollute the natural order. While nature might be sacred in Mononoke, it's far from innocent – the gods' implacable vengefulness at seeing their lands desecrated is seemingly beyond reason, while the Deer God that rules over the forest is as apt to bestow death as well as life with its passing. It's this clear-eyed conception of nature that gives weight to the human characters' determination to fight against it and makes the film's conflicts feel real. Princess Mononoke comes closer than any film I've seen to capturing a theme that perhaps suits high fantasy best: the aching sense of loss at the routing out of magic and the divine from the world, in exchange for the ambiguous benefits of civilization. This isn't some false opposition of 'good' nature and 'bad' humanity, for the divine in Mononoke isn't treated as some twee fairyland, but as a frequently brutal realm too strong and uncanny for ordinary humans; only a liminal figure like San can go between them, and not without danger and sacrifice. The separation of the human and divine realms is inevitable in order for human society to advance, yet marked with tragedy and keenly felt. As a piece of cinema, Mononoke wouldn't be able to carry such powerful themes if it weren't executed with the grace, beauty and technical brilliance that it is. The phantasmagoric landscapes, uncanny creatures and nightmarish demons leap from the screen, while the bustling human settlements and lovable, intimate-feeling characters (at their best in the Irontown scenes) have the charm and warmth to make the human side of the film as compelling as its fantasy elements. Joe Hisaishi's musical score complements the visuals perfectly, with his eponymous theme among his most memorable creations. It's hard to overstate how much a film like Princess Mononoke throws the shallow contemporary anime industry into sharp relief with its soul, ambition, real seriousness and technical accomplishment. It's a wonderful, thrilling movie that should be seen by anyone and a delight to finally see in a high-definition release.